Life is certainly an adventure. One moment you think you're going one way and then suddenly you’re taking a full swing to the right. For me the unimaginable happened. I was told I had breast cancer! The Big C.
The world seemed to stop…then re-engage forward in slow-mo. Of course I immediately spun into denial until finally after my operation I had to face the facts: I had stage two cancer (there are four) with a malignant tumor in my left breast and cancerous cells in my lymph nodes. Even though the surgeon believed she removed everything, she recommended chemo, just in case. That was June 2005. The following month, I was in chemo, enduring the most aggressive therapy available (my choice) and learning how to fight for my life. By mid-fall, my therapy was done, I had a month's reprieve and then back to surgery to remove my other breast. There was a 20% chance of the cancer returning in that one. Too much to risk for me. Even though I didn't know it at the time, I was beginning a new journey: I was taking a big bend in the road. After my last surgery, my whole perspective of life began to change. Actually, I think it was changing during chemo. After operating my own advertising and public relations agency for over 25 years, I decided to turn to my first passion: fine art. For years I had been under a tremendous amount of stress. I realized that I needed to make some changes. Interestingly, I had already started on that path without knowing this was going to be a new destination for me. About four years ago, I began illustrating a travel book that I was also writing. Within a few months though, I found myself illustrating more than writing and before long, I was drawing/painting every evening and every weekend. Any free time I had from the business and home, I spent on art. Slowly I became obsessed. I borrowed books from the library, studied under local professionals [Susan Foley—Pastel, Linda Aman and George Corneil—Watercolor, Renee Paudler—Drawing], listened to lectures, visited art museum, galleries. I just couldn’t get enough. Everything around me became eye candy—shadows were colorful, streets glistened with all sorts of hues, the clouds floated with yellows during the day and a totally new palette at dusk. Suddenly I was back in my college years again, but now I was learning real techniques on how to draw and paint. Unfortunately, in the late 60s and early 70s, teachers wanted us to “express” ourselves, so they never taught us any techniques. I eventually was juried into the Watercolor Society of Oregon and the Oregon Society of Artists and participated in a variety of shows, including the Rose Festival Art Show 2005 and 2006.Today, I still spend a lot of time learning new techniques and methods by taking classes whenever I can. A few months after my surgery, I spent a considerable amount of time writing curriculum for a class I wanted to teach. Then I tested it on volunteers -- thank you all. From there I taught drawing at the Village Gallery of Arts in Beaverton.I haven't looked back since. Today I am a part-time instructor for the Portland Community College Adult Ed program, teaching drawing classes and weekend workshops. I’m also offering several classes at my own Glastonbury Studios in the Porland area. I truly believe anyone can draw. Yes, some people have a penchant for drawing, but that doesn’t mean a person can’t learn. I guess you could say that I am a crusader for those folks who would love to draw, but who believe they can't. Everyone can draw,; it takes learning the basics, commitment and practice. Even Michelangelo, the master painter of the Sistine Chapel, when asked what one had to do to be a great artist, said, "Draw, draw, draw." So there you have it. By facing one of my biggest fears—cancer—I actually created a whole new life for myself. It was there in front of me all the time, I just didn’t see it. I love what I do today and wouldn't want to change the past for anything. Instead I feel like I'm really beginning to live, for the first time ever. Jill Jeffers Goodell went to work at 15 and was still there at 55, pitching projects, closing deals, hitting deadlines before the next cold call. She chose advertising over law school, juggling multiple clients at her own agency, through marriage and motherhood, a Type A making good. Then three years ago, the woman who couldn't quit, couldn't work. Diagnosed with stage 2 breast cancer that had spread to her lymph nodes, Goodell underwent a mastectomy, chemotherapy and a second surgery to remove her other breast in 2005. She had nerve pain. Her joints ached. She lay on her Tigard couch with a rescue Lhasa apso mix who'd lost almost as much hair as she had. Charlie was a sweet pooch. When she threw up, he threw up. But it didn't make her feel better.In a culture in which people are raised to achieve and acquire, Goodell's push to succeed had been stopped cold. In the forced inactivity, questions bubbled around her like a sulfuric pool: Why did this happen to me? What will happen to me? Who am I now that I have cancer? "Here I am, no longer a vital contributor to the world, not getting paid, not going to a job, I felt hopeless and helpless," Goodell recalls. As the blues descended, she called Providence's cancer counseling center and found Diane Harris at St. Vincent's, who had counseled oncology patients for 25 years. Harris had a few questions of her own: What brought Goodell joy? What activities could she totally immerse in that would shift her mood? Who was she underneath? For many people, this is the first time in lives they've slowed down enough to think about 'Who am I?'" Harris said. "'And who am I now?'" The licensed clinical social worker said Goodell was one of the few people who confronted those questions deeply. She enrolled in guided-imagery classes and found a support group in which people use directed thinking to relax and spur healing. Many members had battled cancer for years. They had "horrible stories, but there was a difference -- they were moving forward," Goodell said. For Goodell, that was a turning point. She began to see the darkness around her not as black, but as shades of gray, orange, neon yellow and ghostly white -- as an artist. Art gave her joy. She'd studied fine art in college, designed ads for work and she'd hand-sewn quilts, shirts for her brothers and dolls for her nieces. When she began a travel book years earlier, she spent more time illustrating than writing it. She'd checked book after book out of the Tigard Library. She studied under Susan Foley for pastels, Linda Aman and George Corneil for watercolors, and Renee Paudler for drawing. She listened to lectures, visited art museums, strolled galleries and immersed herself in the old masters. She realized, "I could teach art!" At Harris' urging, Goodell called 12 friends and asked whether they would pay $15 for art lessons. The experiment was so successful that, as she healed, she started teaching at the Village Gallery of Arts. Then she started substitute teaching in Portland Community College's community education program and finally became a regular part-time instructor. She was also juried into the Watercolor Society of Oregon and the Oregon Society of Artists and entered a swath of art shows, including the Rose Festival in 2005 and 2006. She donated an exuberant painting of a bald woman cheering, "Surviving in Grand Style," to Providence St. Vincent hospital's new cancer wing. She never returned to advertising. Instead, on a brilliant September morning, she strides through the Oregon Zoo with four students from her "Sketch'n on the Go" class. Every Wednesday morning, the group visits Portland landmarks for on-the-spot instruction. They pause and whip out chairs, sketch pads, No. 2 pencils and digital cameras to sketch a tiger, the fruit bats and a meerkat. "If you can write your ABCs, you can draw," Goodell says. "You leave this class feeling so good about what you accomplished," says student Mary Kendall. "Jill brings it out in you; she gets me excited," says Joyce Davis. 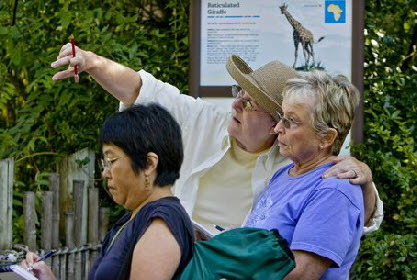 The women move on to the giraffe exhibit when Goodell pauses. Sunshine pours through branches above like holy light. Her husband, Hal, who retired from Intel and returned as a contract employee, has been supportive, but they have had to tap into savings. Their son, Alex, now a junior at the University of Oregon, said his parents' experience changed him. "I'm much more likely to think about quality of life before money than I was before ... their new focus on what's really important has helped me, especially in this time of my life, when I'm choosing my potential career." Alex plans to go to medical school. But it is his mother who has changed the most. "This has brought me so much joy. I see this whole cancer thing as a second chance," Jill Goodell says. "It helped me see the way I was living was nuts." Harris said most people facing a chronic illness often overlook this opportunity. They ignore the chance to take stock and grow, instead becoming more isolated and negative. But, she says, a small percentage find what gives life meaning. "For Jill, it was art," Harris said. "For others, it's going to the cabin on the Deschutes or fishing more, working in an animal shelter or being with the grandchildren. It's being in the moment. And if you enjoy as many moments as possible, it adds up to a lifetime." Goodell calls it living with 20/20 vision. "I may live 20 days or 20 years, but I am living now," she says. "Art forces you to be in the now. I have a whole different life."